I’ve been working in Studio #14 for ten years and have loved the heck out of it but I’ve also outgrown it. An opportunity has come up to move into a bigger space in my beloved William Clark Studios and I’ve taken it. 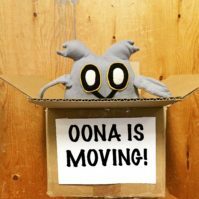 As of November 1st Oona will be located in Studio #10. This entry was posted in Events, Fun Stories, Uncategorized. Bookmark the permalink.